Hats are the perfect accessory for Christmas and New Year. 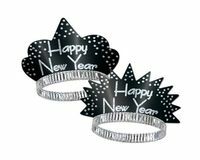 Happy New Year Hats and Tiaras are perfect to wear at any New Years Eve Party. 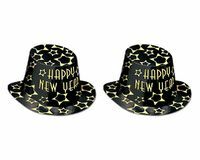 Glitter Top Hats always remain a firm favourite alongside Black & Gold or Silver New Year Hats and buying them in packs such as 25's and 50's always makes shopping easy. Vibrant Foilboard Hats are also a popular choice to add to the party atmosphere. Tiara's add a special look for New Year and are a great choice to wear as are Headboppers with a Christmas feel. For any more information on our various Hats please call our team on 08453 31 34 31.